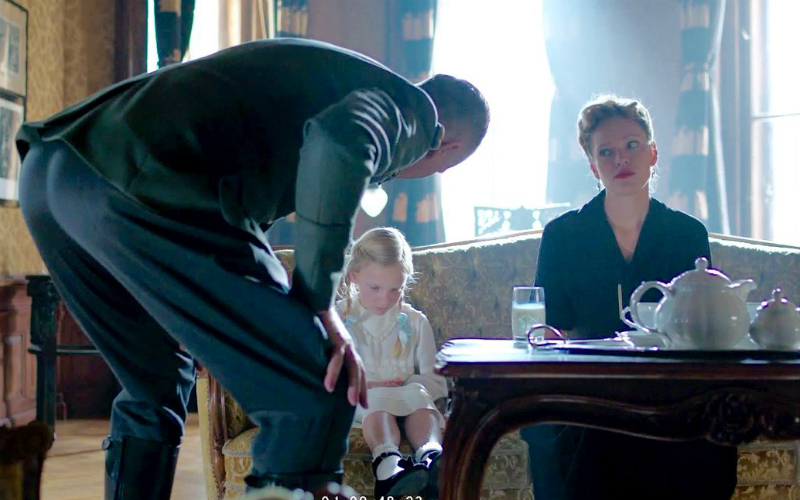 X Company 308: Writer Julie Puckrin delivers “Naqam” | TV, eh? Julie Puckrin, who co-wrote the episode with showrunners Mark Ellis and Stephanie Morgenstern, admits the dialogue made her a bit nervous. Aurora wasn’t the only one who was outed as a spy. Faber (Torben Liebrecht) also had to do some quick thinking after his aide, Edsel (Basil Eidenbenz), turned him in to Obergruppenführer Schmidt (Morten Suurballe). 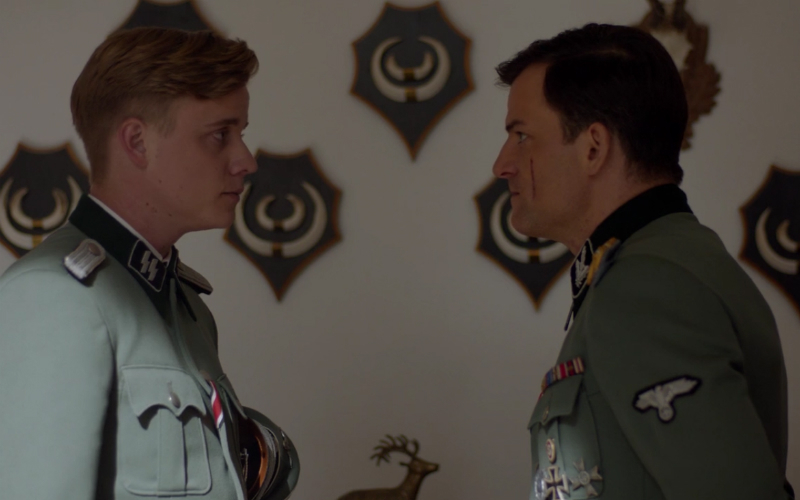 As we barrel toward X Company‘s series finale, Puckrin joins us to tell us more about Aurora’s battle with Heidi, Edsel’s relationship with Faber and give us a few hints about the final two episodes. Unlike Episode 306, you co-wrote this script with Mark Ellis and Stephanie Morgenstern. Was the process of co-writing much different than writing solo? Julie Puckrin: Well, Mark and Stephanie are the showrunners, so we’re always writing to their taste and to their sensibility, and your goal is always to give them what they want. So in some ways, it was really great because I was working even closer with them. It was cool to be closer to their process, and it was cool to be writing the draft with them, because I was like, ‘This is great! I know that this is what they want because we’re doing it together.’ It was actually my first co-write. I’d always written on my own before. But they’re very collaborative and really generous and just great people to write with, so I felt very lucky. This episode continued the parallel paths of Aurora and Faber, in that they were both exposed as spies. We start the season with this whole idea of whether Faber can be trusted, and Faber is an interesting character because, first and foremost, he’s a survivor. He certainly has morals, but when push comes to shove, it’s always about protecting his family and protecting himself. And this was the time when we were like, ‘If he’s going to become a double agent, he’s really going to have to be put to the test.’ What does it look like when, as a double agent, this guy is exposed? What is he going to do, and is that going to destroy everything for our spies, who at this point have kind of been lulled into a sense of security with him and feeling like they have this mutual trust? We know that Heidi has seen Aurora and Faber together, and so we love the idea that Aurora is the first one to feel pressure, and the team thinks that she is going to be exposed, and so all of our efforts are on saving Aurora and protecting Aurora, and nobody even sees this blindside with Faber coming because it’s coming from this innocuous source, which is Edsel. Edsel seemed very torn, but he swore his loyalty to Faber in the end. Will that come into play in the final episodes? I think it’s hard for him, and it’s interesting because Edsel was a character who was raised in Hitler Youth, and that was part of the culture that you inform on your colleagues, that you self-police. We see that idea of the Hitler Youth in both Edsel and Heidi and where they are now, and that idea of self-policing and being raised that way in a sort of culture of suspicion and paranoia, and I think it’s really hard for Edsel because he’s been looking at Faber as this father figure for him, and yet he’s been torn between everything he’s been raised with and this man who is actually the closest thing to a parent he has. I think if we had more seasons, Edsel is someone who we would have wanted to explore a lot more. Because in some ways, we think of him as someone who’s like Faber was when he was starting out, and you’re sort of watching how someone becomes involved in this, and how someone loses their sense of right and wrong, and how your morality starts to become a little slippery and almost conditional. The question that we always come back to is, ‘How could people do these things?’ ‘How could people be part of these things?’ And Edsel was another way into exploring that and how these things become normalized. While Faber was dealing with Edsel and Schmidt, Aurora was fighting off Heidi. I must admit that while I was afraid for Aurora, I almost felt sorry for Heidi because she was so overmatched in the end. Heidi was a character that we were all interested in exploring right from the beginning of the season. I think Sandra [Chwialkowska] mentioned when you talked to her last week that the image of the hunt was something that we really, really wanted to get to, and we knew that once we’d gone there, we had to pay that off big time. I think that where we get to with Heidi is very satisfying, but it’s interesting that you said that you almost felt bad for her, because in a way that’s a great compliment. We took this character who is quite villainous and does some really horrific things, and the question we always had was, ‘How do we make her human?’ Because no one is ever just a monster; everyone is complex. And we hate Heidi, we hate her and she’s an awful person, and yet we kind of understand her. I mean, you certainly don’t understand the things that she wants to do, but when she’s talking to Aurora about what it was like to be in the girls’ equivalent to the Hitler Youth, you sort of start to realize the things that this kid was raised with, the level of brainwashing is horrifying. But I think it also makes you have a little bit of pity. And the fact that Heidi was a woman fighting for her place in an office full of men also made her more relatable to me, evil as she was. Oh, my gosh, yes. We absolutely felt that way. It just happened this season that the writers’ room had a lot more women than men, which was great, and we could all totally relate to that aspect of Heidi, that in wartime there’s opportunity to craft boundaries and advance yourself and improve your situation, and Heidi was going to take advantage of that. When we were doing research into these women that were working for the Nazis and doing a lot of these things, often that was the case. These were opportunities that they never, ever would have had in the rest of their life, and you kind of see why that would be seductive, to have the movement and the freedom and the autonomy to achieve things. So it’s tricky, because you understand where she’s coming from, but the things she’s using that power to do are pretty horrifying. It was interesting to me that Faber had to talk his way out of his jam, but Aurora had to talk and physically fight her way out. Was that intentional? That fight scene between Heidi and Aurora was obviously super-duper physical and very difficult to film and very emotional. I think we had to go there with Aurora. I mean, everything that she’s done has been quite raw and quite visceral, and it’s interesting because looking at Faber’s journey, it’s often been these dramatic chess moves, but with Aurora, it’s been these visceral gut punches of things that she’s had to do, so it’s kind of interesting to see how things are going down with Faber and Schmidt are almost very civilized, and then what’s happening between Aurora and Heidi is so violent and quite primal. Aurora tells Heidi, ‘I want you to know that you were killed by a Jew.’ Was that line written early in the planning stages for Season 3? You know, it’s Aurora’s job as a spy to have to kill Heidi, but I think it is also this tremendous catharsis, which is what the title was inspired by because it means revenge. Obviously, there is no revenge that was going to right those wrongs, but it is a very satisfying moment, hopefully, for the audience. Meanwhile, Sabine agrees to take Ania after her father threatens to have her ‘disposed’ of and calls Ulli things like a ‘parasite’ and an ‘aberration.’ That scene was all the more horrible because it was so subdued. The actor who plays Schmidt, Morten [Suurballe], is a really fantastic actor. It’s a powerful scene, and the things that he’s saying have to be handled quite carefully, otherwise he could seem really arch. In the whole season leading up to it, I think we’ve never questioned that he loved his daughter. I think we’ve seen glimmers of where he has been a good father, and he’s certainly a scary man, but you’ve seen him as human. And this scene is the moment where we really see what is going on here, and I think in another actor that may not have been handled as well, but he just really delivered a wonderful performance that was both chilling but also really believable, which was terrifying. And also at the beginning of the exchange, when Sabine first brings Ania, he’s quite loving with the child. He’s sort of this happy grandfather and then it just switches, and it’s a very believable flip, and a very scary flip. When Schmidt was talking about Ulli, as an American, I couldn’t help but think about the fact I have a president who openly mocked a disabled reporter and think of the rising nationalism in the U.S. Does it shock you how relevant the storylines on X Company still are today? I think it really is shocking. I remember thinking, ‘It’s so important for us to tell these stories.’ And I remember thinking how lucky we are in this age of technology, in this age of access to information, that we can hear stories of the kinds of things that happened. We can hear stories of the kinds of things that happened and hear them in people’s own words, we can read their memoirs, we can see documentaries of people telling their own stories . . . But you certainly never think that it’s going to be a relevant comment on the world as it is today. You hope it’s never going to be quite as relevant as it has become. So that has been an interesting shift to go from working on something and feeling like it’s important to tell these stories to now feeling like it is more important now than ever to tell these stories. And also a certain sense of dismay that people are repeating this history or maybe not learned the lessons that you had hoped we would have taken from them. What will Sabine do now? I think we’ve been talking about Sabine’s journey through the whole season, and she has reached critical mass now. There’s no going back for her now, which I think is going to be very exciting to see. And what about poor Alfred and Aurora? Will these two ever find a moment of peace together? It’s so hard because I believe their feelings for each other are true and that they love each other, but you just keep watching the war throw obstacle after obstacle between them. I think certainly she’s the reason he keeps going, and I think he has become the reason that she keeps going. So in a weird way, they are each other’s greatest strengths, but also in a position to do the most damage to each other emotionally. What’s going to happen now that Faber has Sinclair’s son? It was such a small plant early in the first couple of episodes when Alfred confides that Sinclair has a son, and he does it to try to help bring Sinclair and Faber to the table so they can relate to each other. And then when Sinclair has the tape of Faber, Faber feels pushed and he says, ‘Let’s find Sinclair’s son,’ and it’s been five or six episodes since we’ve seen that. And now Faber is backed into a corner, and he’s got one trump card and he’s going to play it. I think this is the moment when we are perhaps most afraid of him. X Company airs Wednesdays at 9 p.m. on CBC. so I’ll take the tree to my shop fix it up there then bring it back here” His lie fooled the girl so he gave her a cup of water and put her to bed. Then he turned and stuffed the tree up.